Well it’s time to get excited, as you can now access the biggest ever collection from texture legend Denise Love, the mastermind behind 2 Lil Owls. 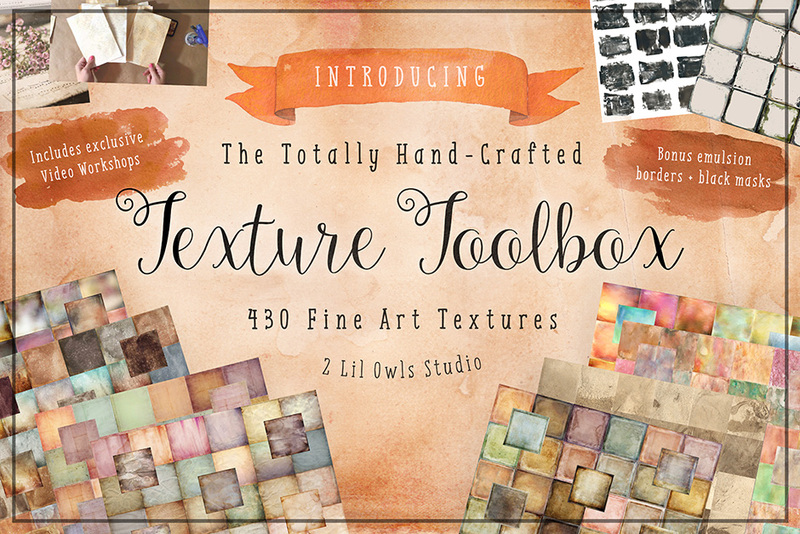 After months of preparation, the Totally Hand-Crafted Texture Toolbox is here – bringing you 400+ hand-made textures, tons of creative bonuses and in depth video workshops! 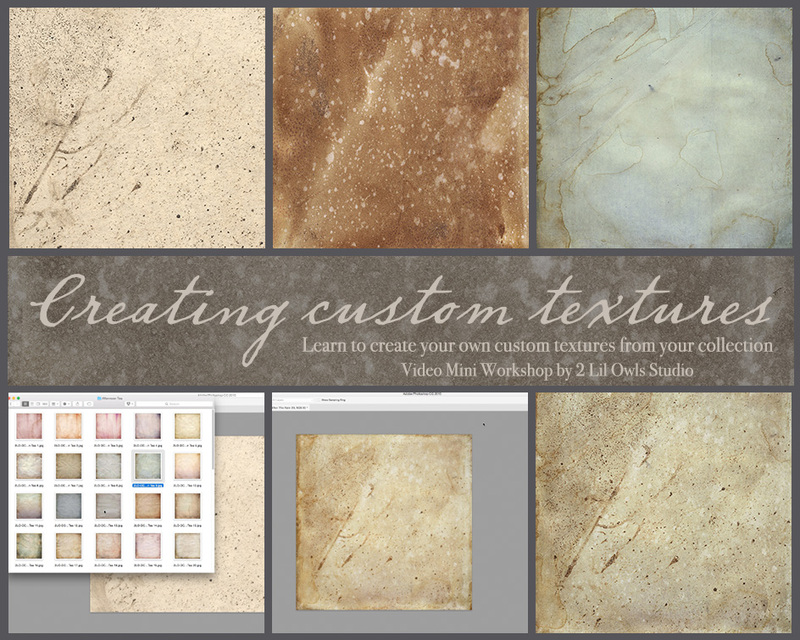 You’ll learn exactly how to work with your new textures, and even how to create your very own from scratch! 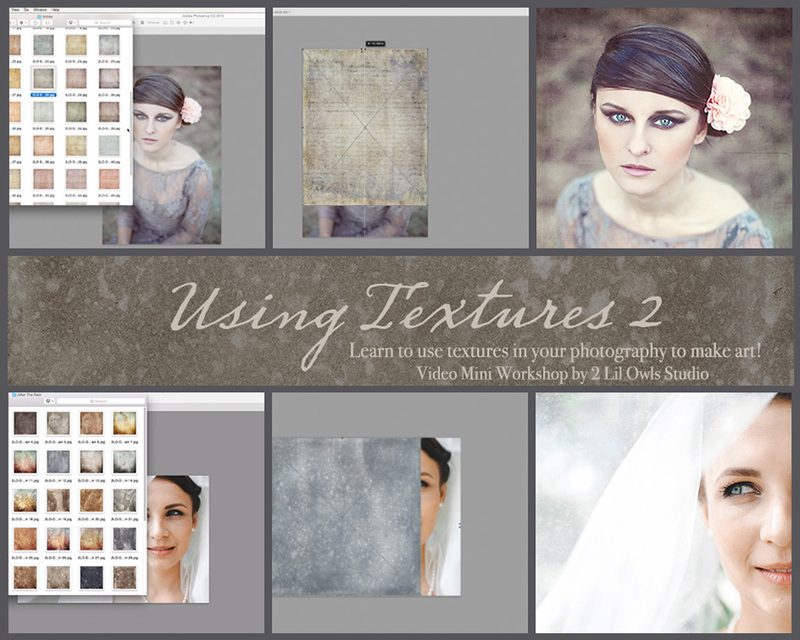 Do you love texturing your photos? You’ll never need to worry about finding that perfect texture again, as this collection includes textures for virtually every aesthetic. Whether you’re looking to grunge up your photos, or add some gorgeous lighting to them, the images in this collection are perfect! Are you new to textures? 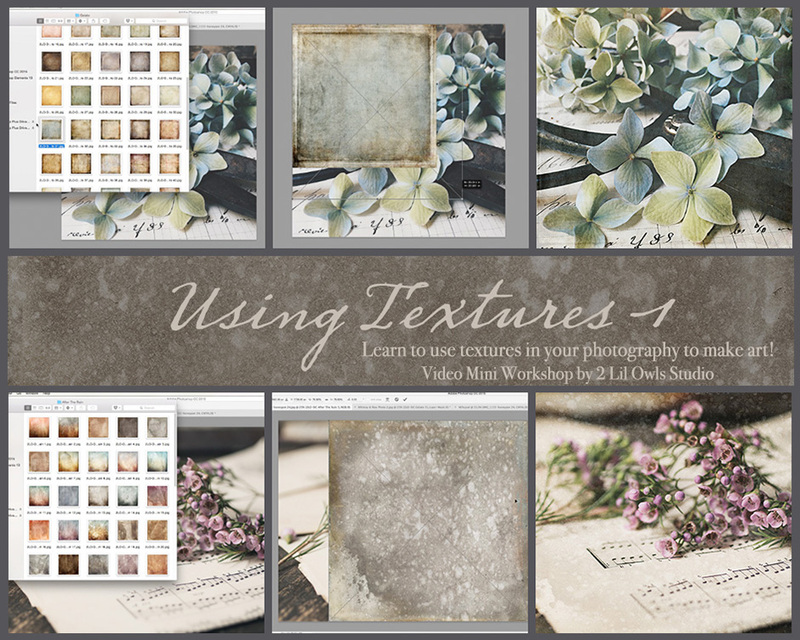 This product is the ideal way to get started using textures in your creative work. 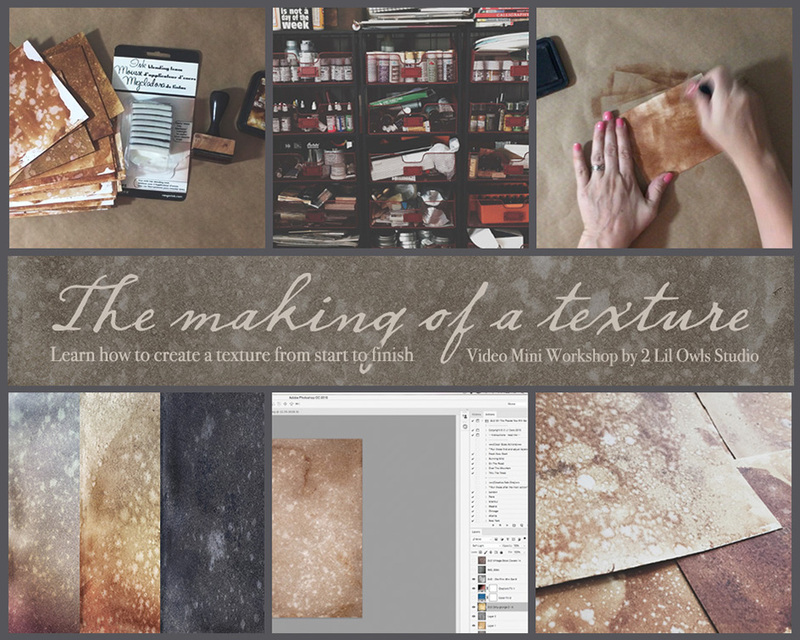 Asides from being incredibly easy to use (you simply drag/drop them), this pack includes bonus video workshops, showing you exactly how to get the most out of your new textures. This is a unique chance to learn Denise’s professional workflow, so you won’t have to worry about trial and error in your own work. Are you looking to create awesome work to sell? Great news! This product includes our Extended License, meaning that you can use these awesome resources in your original design work available for sale. Looking to texture up that new poster design, or perhaps improve the background of your latest greeting card? The Texture Toolbox has you covered! Don’t have Photoshop? Not to worry! These textures come in basic .JPG format, so are compatible with Photoshop Elements, or virtually any other graphics software. Whether you’re into creating super complex art, or just need some effective overlays for your work, these images will fit your needs. Each texture is the result of Denise’s hands-on work, which you can see an example of in the video workshops included with this product. Many of the textures are comprised of several layers of artwork, combined to give a wonderfully detailed, rich outcome. Denise has literally been getting her hands dirty at her work table, wetting, scuffing up, distressed and scanning endless surfaces to give you the most effective results in your work. Check out these creative bonuses! This bundle includes four exclusive videos. To access the videos, please use the .PDF file contained in your downloads. It will provide you with the link to the video page as well as a password to access it. Software compatibility: Most graphic software. Thanks so much for reaching out to us and I’m really sorry to hear that you are experiencing difficulty accessing your videos. You should find that the links and password to these videos are included in a PDF file, however to save you from any further hassle, I have emailed you a dropbox link so that you can download all of your videos to be able to access these offline too :). Also, if I want the frames to be larger or smaller or a different type of rectangle, is it fine to just transform them in Photoshop? Thank you so much for your comment! I can certainly help you out with your queries and have have sent you an email to assist you with this 🙂 I hope it helps! Happy New Year to Team DC & ALL Design Cutters World Wide! Thank you so much for your incredibly kind words! 🙂 It’s fantastic to hear this pack has already made an awesome addition to your creative toolkit. We hope you’re enjoying these stunning textures from Denise! I have this! Woo-hoo! I am looking to see if it is the exact same. I didn’t know about the videos! It is one of my favorite collections from Denise! Woohoo! Thank you so much for your lovely comment, Su 🙂 We’re so pleased you are loving this collection from Denise! Password for the videos link doesn’t appear to be working. Did it change and the PDF not updated? I am so sorry you are having an issue accessing your new videos from 2Lil Owls- we included a PDF file in the download which contains a link to all of the videos and the passwords you need to view them. I am also finding the the password no longer works. Can you help, please? I ordered your texture toolbox through 2 owls on 2 aug by pay pal i have not recived a way to download can you help me. After checking this offer again and again, I finally made the plunge. I did my homework and went to 2 Little Owls site where I downloaded a free sample of 4 different textures not included here. I used these on an image as an overlay and blending options. The result was outstanding…This purchase was a no-brainer! Thanks so much for your comment and your purchase. I am so pleased you like the look of this one and I really hope that it works so well with your creative projects! I am a member of her Texture Club and thought that was a bargain and now I see this offer! Wow! Very happy with this new purchase and love this artist’s work; looking forward to using very soon! I do have a question, I have the PDF with the video link and password – no issue there. But, we typically have a “Helpful Documents” PDF Guide to the resources…is there one for this and maybe I overlooked where to download it? It’s nice to have that PDF reference of what resources you have 🙂 Thank you in advance! Thanks so much for the lovely comment and we hope you get loads out of use out of your new textures! I am so sorry to disappoint you about the PDF guide- these are created for our bundles only rather than our Marketplace items. It is definitely something we will look at though for future products like this though- thank you so much for the feedback :). I downloaded the individual downloads. There wasn’t a pdf file in any of those downloads with the link and password to the videos. Please help. It’s such an awesome package – can’t wait to get started. Sorry – just went back to the download page and saw the link for the pdf. Thank you so much for letting us know you were able to access the videos 🙂 I hope you enjoy them along with your new texture resources! If you do have any other questions or if there is ever anything I could assist you with please do let me know. I’m always happy to help! Well I guess I missed it!Just saw the promotion this morning – August 3 – and saw offer was good until 3:00 PM. Assuming that’s Eastern Time it is only 2:14 PM as I write this (1:14 PM in Central Time where I live) Any exception to the rule? What time zone is the original offer? Or better yet – what country? England? so disappointed that i missed this! we were traveling back home yesterday & running around today doing tedious things like ikea & major grocery-shopping while we had a rental car. not to mention schlepping everything up to the 4th floor! finally got the time to turn on the computer and i missed it by an hour. :(((( excellent set once again – love 2 lil owls! PS: I LOVE the borders and masks!! Thank you so much for your kind words, Judy! I’m so pleased you are loving this texture pack from Denise 🙂 I hope you enjoy working with it! Fabulous Denise! I love these. They will be great for collage art! Here was what Denise said in her email I received this morning…. Thanks very much for making this exclusive huge pack of textures and I agree that you never can have enough (or too much )of these lovely and awesome textures from Denise. And at an irresistible special price. Thank you so much for your lovely feedback and for your marketplace purchases! It’s great to hear you are a big fan of Denise’s work and you are certianly not alone – We absolutely love being able to feature her incredible work 🙂 I hope these textures along with your other new resources make a fantastic addition to your creative toolkit! Thank you, Denise. These are great! Thank you for your lovely comment, Tina! It’s great to hear you are loving the look of this texture pack! Great bundle of textures! I downloaded this in 5 parts and do not have the video links included. I am loving the textures though! Thanks for your comment and thank you so much for your purchase! I apologise for any confusion – we have included a PDF in your downloads that contains a link to the videos and the passwords required to view them. Please do let me know how you get on with this, Diana, and if you have any other queries please do let me know. I’m always happy to help! I really hope you’ll enjoy your new texture resources and will get loads of use out of them. If you need any assistance, please let me know. I am always happy to help! I have to use a password to view the videos. I used my Design Cuts pw but does not work. Is there some password I’m missing? Thank you for your comment, I apologise for any confusion caused! You can find the password along with the link to view the videos in this texture pack in the PDF file featured in your download. If you follow this link and input the password – you should be able to access the videos. Please let me know how you get on with this, Charles, and don’t hesitate to contact me should you experience any problems. I’m here to help! Wow, fantastic set! Can’t wait to dive into it. Like some others, I have the video link, but it doesn’t work. It keeps asking me for my password over and over. Thanks! Hey Liz if you don’t mind me asking, which part are the video’s in? I’m really interested in seeing them but I don’t want to download everything yet – just the part with videos if possible. Thanks! Thanks for the comment and i can definitely help you with this! The links for the videos can be found the PDF page in your downloads- if you follow the links and input the password, you should be able to see them! Please do let me know if you are having issues locating it though :). Hi Carol, thanks yes, I have the videos now. It took me a few tries to get the password exactly correct but now I have access to them, yay! Can you ever have “too much” 2 Lil Owls? This is fabulous! Thank you Denise and Design Cuts! Are these all exclusive textures or are they duplicates of Denise’s Texture club? I hope that helps, Mary, and thank you for your kind words! Please do let me know if you have any other questions or queries. I’m here to help! I don’t have the video files, either…..nice bundle….you know how to reel us in with those owls! Thanks for the comment and we are so pleased you love this pack- we adore Denise and her work :). I have just popped you over an email with the PDF file that has the video links- you might have missed it when you were looking through initially but rest assured we shall get you working with the videos :). Denise Love makes the most incredibly beautiful textures. I am a landscape/architecture photographer and using these textures on my photos transforms them into artwork that can’t be duplicated no matter how many people take the same photo. This deal is awesome! A great deal – very pleased. Where do I find the videos? Thanks for the lovely comment- we are so happy to hear you like this one! You can find the links on the PDF page which is included in your download :). To make things easier for you though, I have popped you over an email including the PDF page! Please do feel free to share anything you create with your new textures as we would love to see what you are working on! How does one get access to the tutorials? Thanks for the comment! So the links for the tutorials are on a PDF page in your download- if you follow the links and input the password, you should be able to see them! Please do let me know if you are having any issues though- I am always here and more than happy to help! Hi, I seem to have missed the PDF also . Can you shoot me the file please. Thanks. Just to be sure, these have not appeared in any previous Bundles, right? So the answer is yes. These sets are all brand new and have never been offered anywhere before. Thank you for commenting! I can certainly help you out with your query. Hello, my name is Jenny Lens. I am an addict. It’s Denise Love’s fault. She’s the dealer who turned me onto this mind-altering DesignCuts. Of course I have to get this! I have 55 different Texture packs, plus masks, frames, ephemera and more. But always room for Denise Love’s great creations. I love her vids. And I’m a member of her Texture Club. Such a deal. Such a life. Such sunshine, so needed in my over-stressed life. Thanks all!! You are in good company – we’re all a bit obsessed with Denise’s work and we are so thrilled to have been able to work with her to bring you this incredible texture pack 🙂 I’m so pleased to hear this could bring some sunshine to your day & I hope these textures find a good home in your growing 2 Lil Owls collection! Thanks for your lovely comment, Jenny! I hope you’re well & if there is ever anything I can help you with please do let me know. I’m always happy to lend a hand! LOVE LOVE LOVE @DeniseLove’s work! This is just too cool, Denise! Awesome stuffs! I keep reading the description and I keep asking myself, what’s the catch? $19 is an awesome deal! Thank you for your comment. I can assure you that there’s no catch whatsoever 🙂 It’s great to hear you are liking the look of this deal & I hope you are able to add these textures to your creative arsenal soon! Just download this great offer! Can’t wait to start creating. But wait I better watch the bonus videos first. Thank you!!! You are very welcome, Hermelinda 🙂 Thank you so much for your purchase! I hope you love working with your new textures. If there is ever anything I could assist you with please do let me know. I’m always happy to help! I only have Photoshop Elements 14. Is it possible to do a tutorial using these textures and this software? Thank you for your reply. Hi there! Wow, another fantastic package! I’m a huge 2LilOwls fan and this is really a treat. Just a quick question…I downloaded everything, but I can’t find the videos. Either I missed something (it wouldn’t be the first time), or the link was inadvertently omitted. Thanks for all the great work you do. I also purchased the Ultimate Artistic Design Bundle, and I’ve got to tell you, I nearly passed out when I saw all the cool stuff – especially the watercolor goodies! I can’t find the videos in the downloads either? Or was it a link I haven’t spotted? Thanks for your comment and your purchase- we are huge fans of 2 Lil Owls ourselves! So the download links for the videos are all included in a PDF page which is part of the download- however to save you time and get you working with your videos, i have emailed you the PDf file to you! Have an awesome time with your new textures! Carol, thank you so much for your help. I knew I must have missed it somehow! What a fantastic offer, I just love everything about this collection. Thanks so much Denise! That is fantastic to hear, Rosemary. Thank you for your lovely comment 🙂 I hope you enjoy working with these awesome textures! Excellent Value. My download didn’t seem to have the videos. Thanks for the comment! I am so sorry you are having an issue locating your videos- we included a PDF file in the download which contains a link to all of the videos and the passwords you need to view them. To make things easier for you, I have also emailed you the PDF file so you can start viewing them straight away! I hope this helps and you enjoy working with your new textures! WOW!!! Fantastic!!!! I cannot let this one go, Even at full price here – $39 – it is an absolutely fantastic collection. Denise’s textures are works of art in their own right! Sounds really great 🙂 One question: What are the dimensions in Pixels? My digital photos are about 8000 Pixels on the long side, is ‘300ppi 15×15 inches ‘ large enough or do I have to upsize the textures? Thank you! Thank you for commenting, I can certainly help you out with your query 🙂 I have sent you a quick email to assist you with this. I hope it helps, and do let me know if you have any other questions or queries! Please provide that information here. Thank you. 15″ converts to about 1440 pixels, so if you did want anything larger than this, then you would need to upsize the textures. Thank you so much for your kind words about this texture pack 🙂 we really appreciate your support!